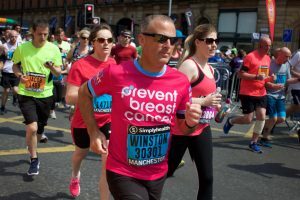 Prevent Breast Cancer is delighted to be offering charity places in the Great North Run 2019! Are you looking for a charity place challenge? If you’re up for taking on the Great North Run 2019, you’re in the right place! This running challenge takes place in September 2019 in Newcastle – and you can run to raise money for Prevent Breast Cancer. The Simplyhealth Great North Run 2019 is the world’s biggest half marathon, with the route starting in the heart of Newcastle, going across the iconic Tyne Bridge and finishing in the coastal town of South Shields. Over 57,000 runners will be taking part in the race, which promises to be an exhilarating and exciting event.